White iPhone 4 Round Up: On Sale Wednesday? Yes, it's finally here! Well, maybe. After many months of delays, the white iPhone 4 may finally make its retail debut tomorrow, according to the latest flurry of Apple rumors. So whether you're holding your breath in anticipation--or perhaps holding your nose--here's what you need to know about the alleged arrival of Apple's much-discussed white handset. The retailer, Van Roey Automation, is already offering 16GB and 32GB models of the white iPhone 4 in limited quantities, although the handset may be sold out by the time you read this. Back in the States, Best Buy is gearing up for the white iPhone's Wednesday launch, reports 9to5 Mac. 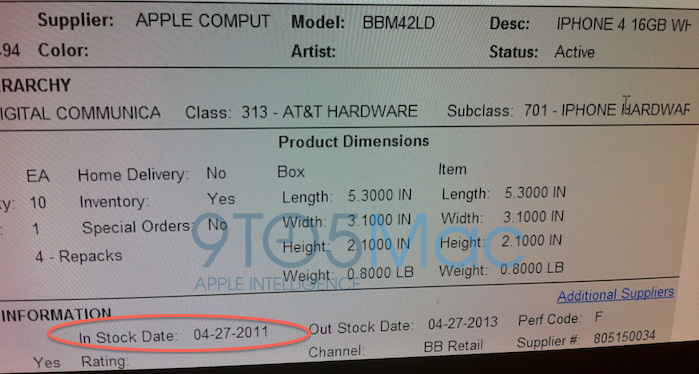 The inventory screen shot below, reportedly from a Best Buy source, shows April 27 as the in-stock date for the AT&T (GSM) version of the white iPhone 4. A Verizon model is reportedly coming too, but it's unclear whether it'll go on sale tomorrow. Apple originally announced the white iPhone 4 in June 2010, but soon reported that manufacturing challenges would delay the handset. Ticonderoga Securities analyst Brian White expects the phone to sell particularly well in China, where white is a very popular color for consumer electronics, Computerworld reports.